Boehringer Ingelheim's Pradaxa drug launch achieved the highest score by judges in any C&IT Excellence Awards category, and also won the Product Launch and Medical & Pharmaceutical awards. Judges said the Pradaxa event demonstrated a strong relationship between Boehringer Ingelheim and Zibrant, which was appointed after a five-way pitch. The agency set about immersing itself in white papers, training and marketing tools supplied by the client to make sure the team fully understood the importance of Pradaxa, a new blood-thinning drug launched as a competitor to Warfarin and estimated to prevent over 5,000 strokes in the UK annually. Pradaxa represented the most significant drug launch in Boehringer Ingelheim’s history, meaning the event needed to be the best launch ever. A strong event identity based around the message 'Our Time is Now... To Change The World' positioned the launch as a key moment in history, like the falling of the Berlin Wall. A visual identity using the cogs of time and the heartbeat was used on all communications and during the event. An excellent teaser campaign created anticipation and delegates were asked what moment in time changed their lives to evoke emotion and set the tone, and to name a piece of music that takes them back to a moment in time, which was played throughout the event. 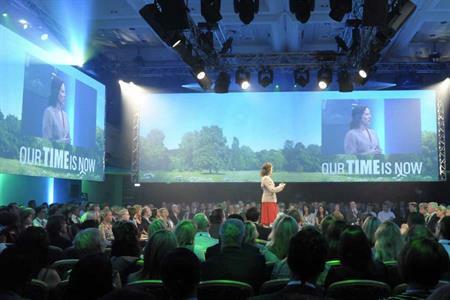 Powerful and emotive videos, imagery and bold words were used on giant screens instead of Powerpoint, with two main environments created – the storm, representing a stroke, and the meadow, where Pradaxa is in your life and it’s a clear sunny day. 100% of post-survey respondents rated the event overall as 2 or above (1 being outstanding) and 95% said it enhanced their commitment to the launch and the company. Boehringer Ingelheim’s prescription sales for Pradaxa have outperformed the market and the drug contributed significantly its growth in the past year, while Warfarin sales have dropped. Read about the rest of the winners of the C&IT Excellence Awards 2012 here.